Toughness is a game mechanic for the durability of every object, item and entity in Prison Architect. Prisoner with a Shotgun killing and destroying with ease. Shotguns deal 25 damage per shot. It primarily functions as health for every Item, Object, Prisoner, and Staff member. Not every entity in the game is given a toughness value, like Contraband, Materials, and certain items. However, entities that can be killed or destroyed that don't have a toughness value will be given one toughness point by default. There are two ways that toughness can be reduced during normal game-play. The first would be through weapons and fighting. Each contraband weapon in the game differs in attack power. Some weapons will do an extreme amount of damage, while others do very minor damage. If a weapon is used against an object or person, its attack power will subtract from the toughness of the target or victim. For example, a Guard has 20 toughness points (without body armour, which would increase his toughness to 30), and Shears have an attack power of 10. If the shears were used against a guard, it would reduce that guard to half of his health in just one hit. Another example is the Chair, it has no toughness value and therefore receives one toughness point by default. If a prisoner were to use a Baton to hit the chair, the chair would be instantly destroyed. This is because the baton has an attack power of 1.5, which would deal 150% damage to the chair in one hit. The second way toughness can be reduced is by fire. When a Fire Emergency Event occurs in your prison, you need to act fast because a fire can destroy and kill everything. Fire has an attack power of 0.1, and applies this damage every in-game minute. Fire also has a toughness value of 10, which doesn't make it easy to extinguish. The main concern you should have is that every material in the game only has one toughness point, which makes walls and floors very easy to destroy by a fire. Especially for prisoners (which have 20 toughness points usually, but may have more due to the "tough" and "extremely tough" reputations), there are more ways to lose health, e.g. starvation, viruses and accidents. 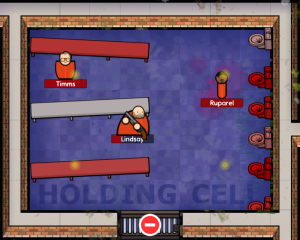 During game-play, prisoners and staff members will start off with full toughness, or health. Once a prisoner gets injured, their health bar will appear behind their name. For staff members, it will simply appear beneath them. If any individual loses over 70% of their health, they will become unconscious and will drop any contraband or equipment they were carrying. Unconscious people must be healed by a Doctor or a Paramedic to preserve their life, or they must wait several in-game days until they regain consciousness. However, a person will die if they lose all of their health, and a Guard will then take the dead to the Morgue until a Hearse arrives to claim the body. A prisoner will also lose toughness when starving. Toughness also applies to objects like Benches, Doors, and Cookers. However, objects do not display a health bar, they will instead highlight red in color when they have been damaged. In addition, objects will also display a damage percentage when the mouse is hovered over them. An object that has been damaged beyond 70% will most likely not function properly, which is especially true for all doors because they will no longer close fully. Damaged objects must be repaired by a Workman, but objects with 100% damage are considered destroyed, and will be trashed instead, unless ordered for repair at full cost. This page was last edited on 19 August 2018, at 02:39.